If you’re lucky, you get to choose a college based on factors other than cost and geography. But choosing a school isn’t always easy. You don’t want to mess this one up—it’ll affect your next four years and arguably, your life beyond school. Your head swims with rankings and reports, advice from well-meaning friends and relatives, and your own confusion about which college environment will be the best fit. How to choose the right one? Visit. If you can, arrange to spend some time at the school. Audit some classes in a field you like, hang out in the student commons, and don’t be shy about asking students about their experiences at the school. While you don’t want to jump to conclusions (one grumpy professor doesn’t mean the academics are lame), listen to your gut… is this where you want to be? Reflect on who you are and who you want to be. If you started a Mandarin club at your high school and wallpapered your bedroom with maps of Europe, you want a school that will allow you to expand your horizons and explore the world. Focus on the study abroad options, which can vary widely between schools. College is also a chance to reinvent yourself. Maybe you spent your high school years in a hockey uniform, but have always wanted to try acting. Daydream about what you’d most like to try in college—it’s the perfect opportunity to grow and stretch—and then research which school will offer what you’re looking for. Talk to alums. A powerful and passionate alumni network can be a useful tool as you make your way in the world post-college. If possible, strive to meet some alums and talk to them about the ways the school helped them in their careers. Step outside your comfort zone. On this point, I speak from personal experience. When I was applying to schools, I ruled out any campus that was not in driving distance from my close-knit family. Driving distance could mean 8 hours—but I vetoed the west coast. Looking back, although I have no regrets, I wonder what I might have gained by living in another part of the country—or in another country— for those four years. Relax. Very few decisions in life are truly irrevocable. If freshman year leaves you dissatisfied, you can always try to transfer. To enter, comment below with your name and email address, and "like" College Gloss on Facebook. Prizing & samples courtesy of Macmillan. About Snap Decision: Maybe Tonight? 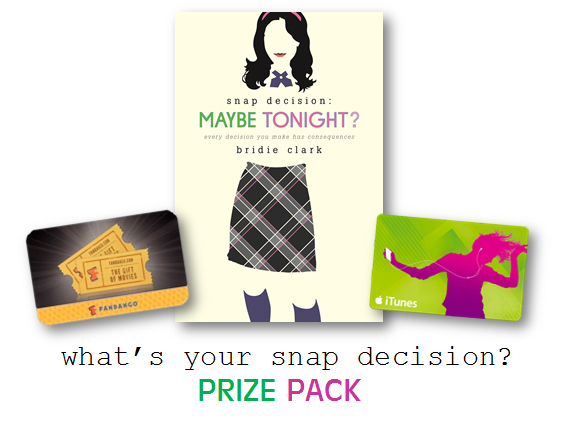 The Snap Decision series invites the reader to participate in the high-stakes social scene of Kings Academy, an elite boarding school where fitting in may require selling one’s soul. 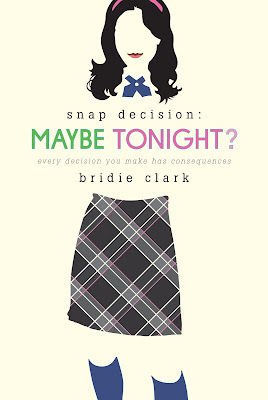 "Maybe Tonight?" opens as the reader is getting ready for the most exciting party of the year—Midwinter’s Night Dream, set in the frosty woods just off campus—with her roommates and best friends, Annabel Snow, Spider Harris, and Libby Monroe. Choices unfold quickly and the reader must decide which risks to take in pursuit of social status, adventure, success, and love. Bridie Clark has worked as a book and magazine editor and written for the New York Times, Vanity Fair, and New Yorkmagazine. Her novels "Because She Can" and "The Overnight Socialite" have been published in 19 countries and featured in dozens of magazines and newspapers, including the Washington Post, the Los Angeles Times, and Glamour UK. She was born in West Hartford, Connecticut and currently lives in Greenwich, Connecticut. 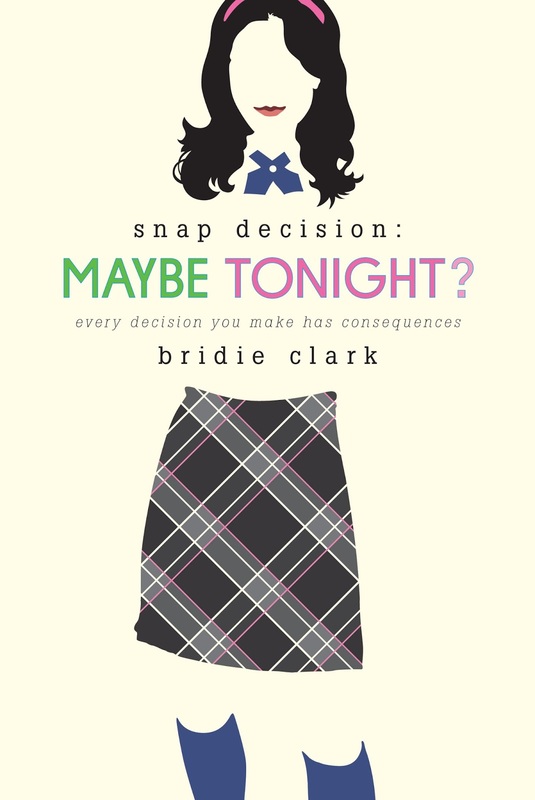 Follow Macmillan and Bridie Clark on Twitter and join the conversation using #MaybeTonight. Thanks for a great giveaway! This looks like a great read! Because she can was beautifully written! I'm a total fan!!!! this looks like an amazing read. Thanks!